The Sport line is designed for the serious club racer. Featuring remote reservoirs for superior fluid temperature control, quick release hydraulic lines (on most models) for easy installation, separate compression and rebound damper valving adjustment and height adjustable spring perches, this kit is beyond the more common coil-over systems on the market. If your driving can benefit for the ultimate in suspension tuning, then this kit is for you. The Moton Sport damper features 15 positions of bump adjustment on the remote reservoir and 15 positions of rebound on top of the piston rod. Each adjustment done to the damper is very noticeable to the driver. 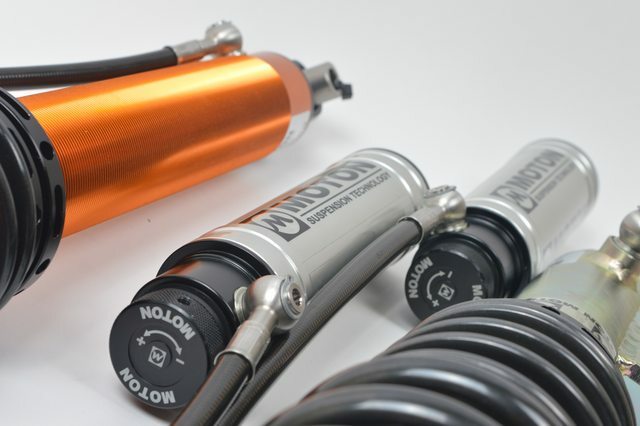 Our Moton Sport dampers are designed to be uncomplicated, easy to use and to deliver the absolute best performance. The Sport dampers perform really well at low speed as well as high speed velocities which gives you total control regardless of the conditions. The reservoir is connected by a high pressure hose and is equipped with swivel banjo's for easy installation of the canisters in the car regardless of the position. The damper bodies are produced from the highest quality steel or aluminum. The shaft are induction hardened and chrome plated. The canister pressure can be varied between 6 - 18 bar (100 - 300 psi) to help support the car in high speed cornering with soft springs.